(Nanowerk News) Choi’s first visualization breakthrough came more than 10 years ago when his team, for the first time in the world, used a confocal microscope to observe velocity fields in a micro-channel, in a space with a diameter smaller than a pin. C.K. Choi, left, and PhD candidate Shuo Wang examine flow fields in a micro-channel, using the Nikon TI series inverted microscope. His next pioneering move was an innovative use of a technology Choi describes as “beautiful,” the Total Internal Reflection Fluorescence Microscope. He integrated this system with other optical devices to help researchers literally see in the dark, creating fluorescent images clear enough to examine nanoparticles and proteins near the surface. 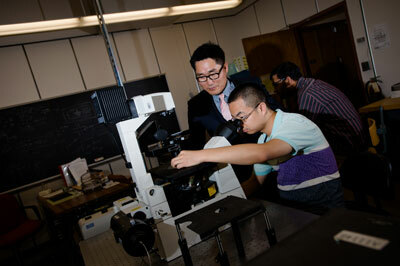 Choi sought practical applications for his optical devices and found them in biomedical engineering. Researchers were using electrical measurements to analyze physiological changes of cells inside blood vessels, but needed an optical way to verify the data. He proposed using indium tin oxide (ITO), a common coating used in modern electronics. His hunch worked: the ITO biosensor offered the perfect marriage of optical transparency and electrical conductivity, allowing both electrical measurements and visual observation simultaneously. He knew that he couldn’t mimic all the body’s natural conditions, but he could at least create a device that allowed medical researchers to examine their cell lines under appropriate flow conditions. Actually very low flow conditions, as is the case with lung cells. In his search for a device that could create ultra-low flows, Choi realized that neither direct current (DC) nor syringe pumps could be used: most mechanical pumps cannot produce consistent flow in micro-channels, and DC can physiologically affect the cells being studied. Exposure to DC can alter the metabolism and nutrients, especially problematic for stem cells which are highly sensitive to environmental changes. Choi and his collaborators proposed using diodes, which are cheap, reliable components, to drive the current in their “electro-osmosis diode pumping” device (EOS). It worked. The EOS creates low, consistent flows in a way that does not affect cell growth and contains optical elements to visually track the fluorescent particles. This diode EOS has many promising applications. Because it’s so small and economical (a diode only costs a few cents), many units could be set up to culture cells quickly. Additionally, the diode EOS could be used to test the efficacy of pharmaceuticals, the presence bio-hazards or the effects of toxins. “You could take this “lab-on-a-chip” and expose it to various environmental conditions, say a radioactive area, then examine the cells at the molecular, tissue, and cellular levels to see how they were affected,” Choi explains. His passion to help others see is contagious—and illuminating.